The 24th Annual Panama City Scottish Festival & Highland Games is moving over to Panama City Beach at Frank Brown Park! The popular event has been a mainstay in the area, and will find more room at Frank Brown Park’s festival grounds for the event’s activities, which include Scottish Athletic Competitions, Scottish & Irish Musical Performances (such as bagpipe bands and Irish Step Dancers), a British Car Club Show, Children’s Activities, and Scottish & Irish food and drink. Back by popular demand this year is the Scottish Tea Room. 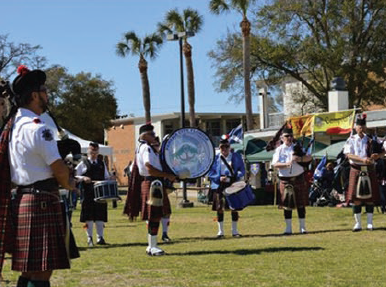 The 24th Annual Panama City Scottish Festival & Highland Games will be held Saturday, March 5, 2016, from 9 a.m. to 4 p.m., with a welcoming ceremony and parade of Tartans held at 12:00 Noon. Attendees are invited to stay for the Ceilidh (pronounced “Kay-Lee”), which will also be held at Frank Brown Park from 4 p.m. to 9 p.m. and will include entertainers from the festival taking to the stage to perform individually and together in a closing jam session. Tickets to the event are available at early bird pricing now for $15 at www.PCScotFestival.com, and $20 day of admission. An additional $5 discount is available for members of the military, students, and children ages 6-11. Admission is free for children 5 and younger. For a full schedule of events visit www.PCScotFestival.com.